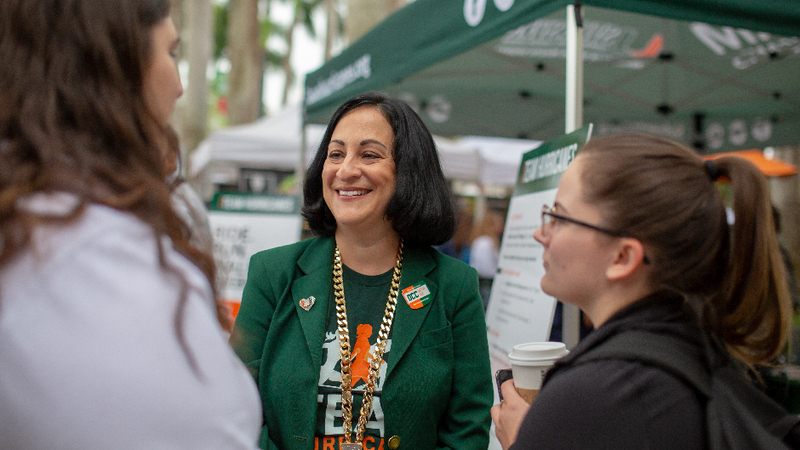 Jacqueline Travisano, executive vice president for business and finance and chief operating officer, shares why she supports the University’s Sylvester Comprehensive Cancer Center by participating in the Dolphins Cancer Challenge. We learn from an early age that it is better to give than to receive. We are taught to give, and it feels good to help someone in need. But there is a deeper current to giving. Whether you have offered emotional support for loved ones, volunteered your time to assist an organization, or donated money to charity, by giving you made an impact in someone’s life. Giving our time, talent, and treasure can be transformative to those in need. One of the causes I am deeply passionate about is funding cancer research after losing a dear friend, a treasured colleague, and my only aunt. That’s three different people taken by cancer, and I know I’m not the only one. This is actually what drives my passion to serve as the vice chair and participate in the Dolphins Cancer Challenge IX (DCC IX). As previously mentioned, the University is expanding its support of DCC, and with your partnership, we will field the largest team in the University’s history on Saturday, April 6, at this family-friendly event hosted at the Hard Rock Stadium. Together, we have continued to be exemplary in supporting our community by exceeding participation goals in initiatives like the United Way. Now, I ask of you to join me in supporting the University’s Sylvester Comprehensive Cancer Center. Let’s ride, run, walk, and celebrate together those fighting for cancer research. Learn about the new incentives and Team Hurricane participation details! Are you ready to join #CanesAgainstCancer? Register, donate, or volunteer for DCC IX now!